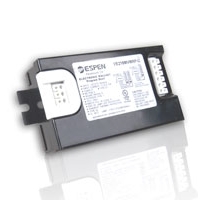 The Espen 13-watt CFL Quad Lamp Electronic Ballast can be used with CFQ13W/G24q or CFTR13W/GX24q lamp types. This high power electronic ballast contains no PCB's, is both UL and cUL Listed, and recommended for commercial use. The ballast is operational with either 1 or 2 lamps. It comes with side/bottom exit leads.